Apple today is holding its "Back to the Mac" media event, where it is expected to introduce several new and updated products. The event is scheduled to kick off at Apple's corporate headquarters in Cupertino, California at 10:00 AM Pacific Time / 1:00 PM Eastern Time, or just about an hour and half from now. Just about two hours ago, Apple announced that it will be offering live video streaming of the event to compatible Apple devices. In addition to Apple's video stream, we will be updating this article with coverage as the media event unfolds. We will also be issuing Twitter updates through our @MacRumorsLive account. - A reliable source has just provided us with details on Apple's planned releases for today, including revamped 13.3-inch MacBook Airs at 1.86 GHz or 2.13 GHz and 128 GB or 256 GB of flash memory, iLife '11, and a "K99" product that could be the new 11.6-inch MacBook Air. - Some More Details about the 11.6-Inch MacBook Air? - Mac OS X 10.7 to Get iOS Scrollbars? - New MacBook Air and Revolutionary Mac OS X Feature on Wednesday? - Apple's video streaming page for the event is now active, although the stream has not yet begun. - The video stream is now up and running, but currently just showing copyright info. - Steve Jobs giving brief intro...in this intimate setting, we'll have some of our engineers on stage to share our new products with you. Tim Cook on stage to update on state of the Mac. - Mac install base just shy of 50 million worldwide. Last quarter, Mac grew 27% year-over-year, compared to 11% for overall industry. We've outgrown industry 18 quarters in a row. - NPD says Mac's share of retail sales in the U.S. was 20.7%. - 600,000 registered Mac developers, growing at 30,000 per month. Highlighting Valve and Autodesk as new entrants, Microsoft as continuing partner. - Customer satisfaction surveys continue to show Apple as #1, year after year: ASCI, Consumer Reports, PCWorld, PC Magazine. - Feeding the Mac momentum has been Apple retail. Stores had 75 million visitors last quarter, sold 2.8 million Macs over the last year, 50% of those to customers new to Mac. 318 stores in 11 countries, highlighting Upper West Side store in Manhattan, Paris Opera House, Covent Garden in London, "jaw-dropping" Shanghai store, new Beijing store. Chinese stores are highest traffic of all retail stores. - Jobs back on stage, asking people to silence phones. - Now introducing new iLife. iLife is why some people buy a Mac. We keep improving it every year or two, and we've got a new one today. iLife '11. Same apps, and we'll offer a look at three of them today. - iPhoto '11: New full screen modes ("can live in full-screen mode"), Facebook enhancements, emailing photos, new slideshows, big leap in books (printing over 2 million per year), letterpress cards. - Demo of iPhoto with Phil Schiller. - Showing off full-screen Events, Faces, Places. Toolbar in full-screen mode is very iOS-like. - Demonstrating new automatic slideshows. - Showing Album view. Automatically pulls in photos from Facebook and Flickr accounts. - More slideshow templates being demoed. - Emailing photos: Select photos, click share, select email, and email is automatically created directly within iPhoto. Photos organized in scrapbook-like template. Can reorganize and provide titles. - Info tab offers timeline of activities for a given photo: emails, postings to Facebook/Flickr, as well as comments made on the photos from social networking sites. - Demoing photo book creation with carousel to choose themes. iPhoto pulls information about the photos in an album to create the book: Higher-rated photos will be chosen for larger prints, photos taken at the same time and location will be presented together. But everything is customizable. - Full-screen Project view. Wooden bookshelf like in iBooks to show all iPhoto projects...books, cards, etc. - Letterpress cards. Playing a demo video from in iPhoto. Uses a raised plate to print and also deboss the card. - Jobs back on stage. "This is why we do what we do". Recapping iPhoto highlights. - iMovie '11: "This is a great release." #1 request was for better audio editing. We've responded with something amazing. All-new tools. One-step effects, people finder, news and sports themes, movie trailer creation. - Showing off color-coded audio waveforms, with click-and-drag audio level adjustments, fade-ins, etc. Can select segments and adjust audio. Can apply audio effects...slow down, speed up, etc. - One-step effects. Select a video segment for instant replay at various speed options. Temporary "snapshot" freezing of video with Ken Burns effect in video. Complex editing with just a few clicks. - Creating movie trailers. Can fill in movie name and date, cast members, create studio names, choose from logos, fill in credits. Storyboard tab to show pacing and timing before footage is even added. 15 different trailer styles with original scores with the London Symphony Orchestra. - Face detection pulled from iPhoto into iMovie. Automatically finds group, action and other shots for use in movie trailers. Ubillos pulling individual segments being pulled into the trailer based on tags created by detection technology. - Showing off final product put together in just a few minutes. Can share on Facebook and Vimeo in addition to existing options. Also playing two additional movie trailers as examples. - Jobs back on stage. Recapping iMovie. - GarageBand '11: Flex Time, Groove Matching, new guitar amps and effects, new guitar and piano lessons, "How did I play?" - Xander Soren on stage to demo. - Groove Matching: single click allows users to pick one track as the "Groove Track" and apply the groove to every other instrument track to lock together in a single "human" rhythm. "Kind of like an automatic spell checker for bad rhythm." - Flex Time: Waveform editor can easily stretch or shrink segments. Showing the stretching one guitar chord to match the sustained chords played by others. - Showing new guitar and piano lessons. - "How did I play? ": Using a USB keyboard to play along with GarageBand orchestra. Correct notes light up in green, mistakes show in red, timing issues shown in yellow. Percentage-based overall score also shown in real-time. Timeline shows exactly where mistakes were. GarageBand builds a history each time you play to chart improvements. Works with piano and guitar. - Jobs back on stage. Over 5 million people now using GarageBand. - So, that's iLife '11. All this amazing engineering. Free with every new Mac. $49 to upgrade existing versions. Available today. - Next up, FaceTime. Introduced in June with iPhone 4, brought to iPod touch in September. 19 million FaceTime devices sold in four months. Today, announcing FaceTime for the Mac. - No separate buddy list required, just pull from Address Book. Full-screen capable. - Jobs demoing. Uses iMac to call Phil Schiller on an iPhone 4. FaceTime for Mac auto-rotates video feed based on orientation coming from iPhone/iPod touch. - Now, "the entree for today": Mac OS X. We've had seven major releases in the last decade. We're really happy with Snow Leopard, but we want to take it even further. Preview of Mac OS X Lion. 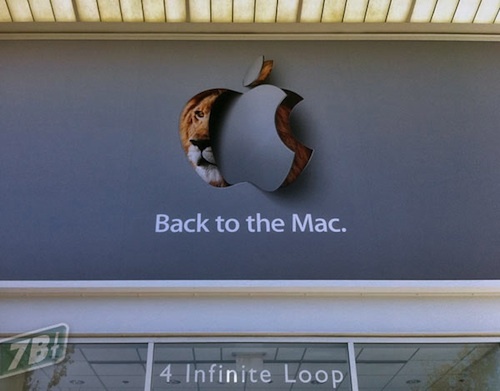 - Philosophy of Lion: "Back to the Mac". We started with Mac OS X, and created iOS from it. Created some new things there, and moved it to the iPad. Now we want to bring some of that back to the Mac. Lion = Mac OS X + iPad. - iPad features we'd like to bring back to the Mac: Multi-touch gestures, App Store, App Home screens, full screen apps, auto save, auto resume when launching. - Multi-touch. We've done lots of research, but multi-touch doesn't work on vertical surfaces. Great demo, but terrible ergonomics. That's why focus on the trackpad, Magic Mouse, and Magic Trackpad for multi-touch. - App Store: Over 7 billion App Store downloads on iOS. We'd like to bring it to the Mac: Mac App Store in Lion. Best place to discover apps...not only place, but best place. One-click downloads, free and paid apps (same 70/30 revenue split), automatic installation, automatic app updates. Apps licensed for use on all personal Macs. - Launchpad: Home screen for Mac App Store apps. - Expose, Full screen apps, Dashboard, and Spaces...four great features on Mac OS X. Wouldn't it be great to unify them all? New feature: Mission Control. View everything running and instantly navigate anywhere. - Craig Federighi to demo. - Demoing Mac App Store. Very similar to existing App Store. "Top" lists, categories, updates, etc. Showing purchase and installation with Pages. Description, screenshots, customer reviews, one-click purchase. App icon flies into Dock, and you're ready to go. - Demoing Launchpad. Full screen grid of all apps. Can organize using drag-and-drop and with iPad-style pages of apps. Also folders just like on iOS. - Full screen apps. Showing a PDF in Preview, sweeps open into facing pages view in full screen. Gestures to move between pages. Multi-touch gesture to move back to desktop, and then back to app. No need to manually leave full-screen mode. - Mission Control: Expose view of open windows, Dock on bottom, etc. App clusters in Expose bring multiple windows from a single app together. Gestures to open up clusters. - Jobs back on stage. Recapping the new features. I wish we had another hour and half to show you more. - Our plan is to release Lion in summer 2011. We feel real good about it. - Talking more about Mac App Store. We think it's going to be really great, and we don't want to wait for Lion, so we're going to put it out on Snow Leopard. Opening within 90 days. Developers can go to our website to learn about it today. Begin accepting app submissions next month. - Reviewing status of the Mac. 33% of revenue, $22 billion business (#110 on Fortune 500 if standalone), 20.7% share of retail sales, retail stores bringing more and more people into the Mac tent. iLife '11 with new iPhoto, iMovie, and GarageBand. FaceTime on Mac. Mac OS X Lion. Mac App Store. - What would happen if a MacBook met an iPad? - Some features we might like to see: instant on, great battery life, amazing standby time, SSD, etc. - This is the result if a MacBook and an iPad hooked up: the new MacBook Air. We think it's the future of notebooks. - 0.68" at thickest point, 0.11" at thinnest. Weighs 2.9 lbs. Rigid and durable with complete aluminum unibody construction. Full size keyboard and full size glass trackpad. - 13.3" LED display at 1440x900, more than on our 15" MacBook Pro. Core 2 Duo processor with NVIDIA GeForce 320M. FaceTime camera. - No optical drive, no hard drive. Moved to flash storage...we know the benefits: Instant-on, up to 2x faster, more reliable, and 90% smaller and lighter, silent operation. - Battery life: Wireless web tests yield 7 hours, 30 days of standby time. The PC industry's battery tests don't often reflect real-world results. We've developed more stringent tests , and the new MacBook Air still gets 7 hours under the new tests. The old MacBook Air gets only 5 hours by that metric. - Showing the guts: flash memory right on the board, 802.11n Wi-Fi, CPU, GPU, RAM, stereo speakers, battery...just like in leaked prototype. - Now, this 13.3" MacBook Air isn't the whole story, because it has a younger brother too. 11.6 inches, 2.3 lbs., 1366x768 display, more than our MacBook. 5 hours of wireless web battery and 30 days of standby. - Pricing: 11.6-inch/64 GB at $999, 128 GB at $1199. 13-inch/128 GB at $1299, 256 GB at $1599. All with 2 GB of RAM. All available today. - Showing ad for new MacBook Air: "Everything we've learned, has come down to this." - Showing feature video similar to those for iPad and iPhone 4. - Jobs back on stage. We've got a hands-on room set up for you guys to test this out. Thanks for coming.